George Hapipis at A1 Yacht Trade Consortium tells he's about to announce a €300,000 price cut on the 36.5m motor yacht Kivircik. Built by Turkey’s Mengi-Yay yard in 2009, Kivircik sleeps up to 12 guests in a master cabins, two doubles and two twins with two Pullman berths. 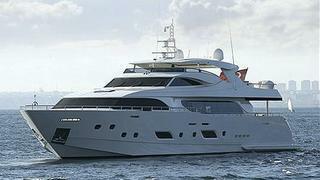 Her powerful twin MTU 12V 4000 engines and planing hull give her a top speed of 25 knots. Kivircik is down from €6 million to €5.7 million.